Cycling in Tenerife - a way to explore the island, keeping fit at the same time! Cycling in Tenerife - explore the island and keep fit at the same time! Just in case you're thinking that "Cycling in Tenerife" should be in the section on "Sport", this page is concerned with cycle routes as a way of exploring the island. Tenerife offers three different areas that are ideal for cycling. If you're an avid cyclist at home, why not bring your bike with you? An airline will transport it for a fee of between £15 and £50 (you should shop around). It will have to be packaged in a certain way to be accepted, however. The bicycle must be in a bicycle box or bag - only one per bag allowed. This bag or box should contain no other items of luggage. The tyres must be deflated, the handlebars must be flush with the frame and the pedals must be flush against the frame or removed. The bicycle should be listed as "sporting equipment". Alternatively, if you don't want to go through all this rigmarole, simply hire one on your arrival. Wear flourescent or reflective clothing. Watch out for the tour buses (especially on mountain bends). As mentioned above, there are three specific areas providing excellent routes for experienced cyclists. 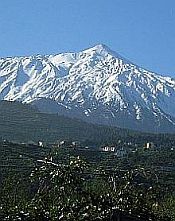 The whole of this northwest part of Tenerife is extremely mountainous and, therefore, pretty challenging. You'll have calf muscles the size of melons when you've finished! You can't, however, get more mountainous than Teide, can you? The most obvious challenge for cycling in Tenerife, you can also find reasonably easy rides in the mountain's surrounding areas. Up in the northeasterly tip of the island, there are mountainous landscapes and cycling challenges galore. This company offers professional guides to lead you on all the cycle tours around the island. The price for any of these is the same: 45 euros. There is also a special price that includes bike hire and lunch: 75 euros. A company offering the full package. Not only a selection of guided tours, Cycling Tenerife also provides a choice of accommodation - bed and breakfast, or bed, breakfast and evening meal. Guided tours are offered daily of either 60 or 100 kilometers. As its name suggests, based in the town of El Medano, offering cycle tours, bike rental and accommodation. For those of you more interested in leaving the proper roads and venturing onto the mountain dirt tracks, this company specialises in mountain biking, offering a selection of tours, plus accommodation. Polka Dot Cycling offer winter/spring training & preparation cycling weeks for those looking to improve their fitness for the forthcoming racing or sportive season. All weeks are fully coached, guided and supported (inc. weeks coached by Dave Lloyd), based in La Caleta and at the Parador Hotel, where Bradley Wiggins and the Sky team stay. They also run Tours and the option to bring your family as well.